Gate access controls enable you to control who has access to an automatic gate operator, to residence, commercial, or industrial facilities. There are different devices that can control a gate. A device that utilizes a pre-issued card which the holder touches or waves in front of the reader. The card contains the code which the reader will verify or reject. Cell phone gate entry systems allow you to control your gate through your cell phone, either via text, call, or an app. This device has a numbered keypad and users must input a numbered code in order to trigger the gate to open. Some of these keypads can hold hundreds of codes and can have latch codes which hold the gate open. This can be useful for parties or when you expect a visitor. Some customers like to talk to guests before letting them enter. Telephone or intercom systems provide for this. Some include video cameras to display visitors and even send the signal to a recording device. This option is ideal for homes, gated communities and apartments. The AAS Advantage DK ADV1000 standalone keypad is fully programmable from the beautiful lighted.. The AAS line of StandAlone Proximity card readers combine the latest in proximity technology with th.. 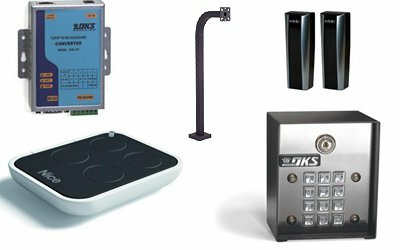 The DoorKing model 1506 series is a small compact stand alone digital keypad unit that is loaded wit..
Our highest quality and easy to program stand alone device that's simple to install and user friendl.. Led lighted directory displayUp to 27 resident / tenant phone numbersModular design makes installati.. Provides service for up to 1000 residents. Led lighting illuminates keypad and directory Built-in di.. The model 1812 is a unique telephone intercom system that allows homeowners to use their telephone a.. The Doorking 1812 Plus is an updated version of the 1812 Classic and features an upgraded processor,..
DoorKing offers the AWID proximity card readers are compatible with the 1830 Series access controlle..
Anti pass back can be programmed in different modes for complete control into and out of secured are..
-Big characters half inch LCD display- Stainless steel plate and anti-vandal features protects all i..